Patients with CML can experience high symptom burden and require greater symptom management support. Study results to be presented at the 2017 American Society of Hematology (ASH) Annual Meeting show that patients with chronic myeloid leukemia (CML) experience high symptom burden and feel that they require more support managing symptoms and adverse events. With advancements in medicine, patients with CML are achieving superior outcomes and living longer, but this does not prevent complications and symptoms from the disease and associated treatments. For this study, investigators analyzed the questionnaire results of 310 patients with CML who enrolled in the Cancer Support Community’s Cancer Experience Registry. Patients answered questions regarding CML history, symptoms, and treatment, which were then compiled to determine a symptom burden score and quality of patient-provider communication about side effects (SEs) score. Approximately 50% of patients reported they wished they had received more assistance with management of short-term side effects, and 59% with management of long-term side effects. 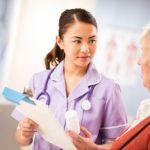 Only 65% of patients felt that communication about treatment side effects was adequate, and 74% indicated it was “somewhat” to “very easy” to get in touch with their healthcare team with questions or concerns, and 76% believed their healthcare team took appropriate amounts of time to speak to them about their concerns. A regression analysis revealed that 3 predictors accounted for 51% of the variance in communication quality regarding side effects (R2 = .51, F [3,268] = 93.68, P <.001). Patients who felt the quality of communications regarding side effects was poor experienced less confidence in coping with side effects (semipartial r =.33, P <.001), were more reluctant to tell the healthcare team about side effects (semipartial r =−.34, P <.001), and had a greater desire for more assistance managing long-term side effects and symptoms (semipartial r =−.21, P <.001). The most frequently reported symptoms experienced by patients included fatigue (70%), muscle aches (57%), sleep disturbance (46%), loss of concentration/memory (42%), sexual or intimate relations problems (38%), bone pain (37%), rash or skin issues (35%), anxiety (34%), and diarrhea (32%). Zaleta AK, Miller MF, Johnson J, et al. Symptom burden, palliative care needs, and patient-provider communication among chronic myeloid leukemia survivors. Poster presentation at: American Society of Hematology 59th Annual Meeting & Exposition; December 9-12, 2017; Atlanta, GA.